There’s another reason ozone is such an important tool in our holistic dental practice: its versatility. It can be used as a gas, as we looked at last week, or in water or oil, allowing it to be used in a wide variety of dental applications. Ozonated oils are particularly helpful, as they can be easily incorporated into your home hygiene routine. A recent study in the Journal of Clinical and Experimental Dentistry looked at the antimicrobial properties of a new brand of ozonated olive oil, comparing it to a number of chlorhexidine-based products (CHX). Such products are often used after oral surgery or, short-term, as part of periodontal treatment. The new ozonated oil was a relatively moderate antiseptic. Gram-negative bacteria proved to be more sensitive to ozonized olive oil than Gram-positive ones. 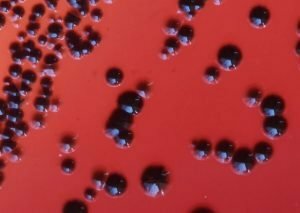 Gram-negative and Gram-positive bacteria get their name from Danish scientist Hans Christian Gram, who discovered that a violet dye could differentiate bacteria “based on the structural differences in their cell walls.” Gram-positive bacteria retain the dye, while Gram-negative bacteria do not. Colonies of P. gingivalis, one of the microbes involved in gum disease. Both kinds are involved with oral problems. With gum disease, it’s mostly Gram-negative bacteria that are involved. With caries (tooth decay), it’s mostly Gram-positive species. In this case, then, the ozone oil proved more effective on periodontal pathogens (harmful bacteria) compared to those involved with tooth decay. The ozonized olive oil demonstrated a lower antibacterial activity if compared to the CHX-based agents. This is also at odds with previous research that the authors discuss. Authors that compared the effectiveness of ozone gel with that of CHX, against periodontal microorganisms, showing no significant differences in the antibacterial capability of ozone compared with that of 2% CHX. Another study compared the effect of periodontal pockets irrigation with ozonated gel or 0.2% CHX in patients with chronic periodontis, concluding that ozone application represents a stronger alternative to CHX and it may serve as good tool during supportive periodontal therapy. Furthermore, in discordance with our findings, Baysan proved that the number of Gram-positive bacteria in carious root lesions is considerably reduced by ozone therapy, and that the lesions clinically change, arresting its progression. Similarly, two other studies demonstrate a strong antimicrobial activity of ozone against S. mutans infections in vitro in bovine dentine as well as in ex vivo conditions. Whether the “moderate” antimicrobial ability observed is specific to the product these researchers tested or more general, the fact remains that it is effective. There’s another important benefit to ozone, as well: no side effects. Chlorhexidine, on the other hand, is well known for discoloring teeth. It’s also not recommended for children under 12, while ozone may be safely used by anyone. You can easily find good quality ozonated oils to buy online. Small ozone generators for home use are also available, letting you ozonate your own oils – as well as water – at home. In fact, using ozonated water in a water flosser can be a terrific addition to your home hygiene routine, supporting good periodontal health. But as amazing as ozone is, it’s also important to remember that it’s just one tool – just as oral hygiene is just one part of keeping your mouth healthy. A nutritious diet, regular exercise, good sleep habits, and all the rest we blog about here are just as important. As always, it’s the big picture that matters.